In May I wrote about six young men embarking upon a challenge most of us would consider folly: a run from Montreal to Vancouver in 28 days, 4,632km in the name of cancer research. Their goal was to raise $50,000 for the Terry Fox Foundation. And they did it. Well, not the $50,000, yet, but the run! 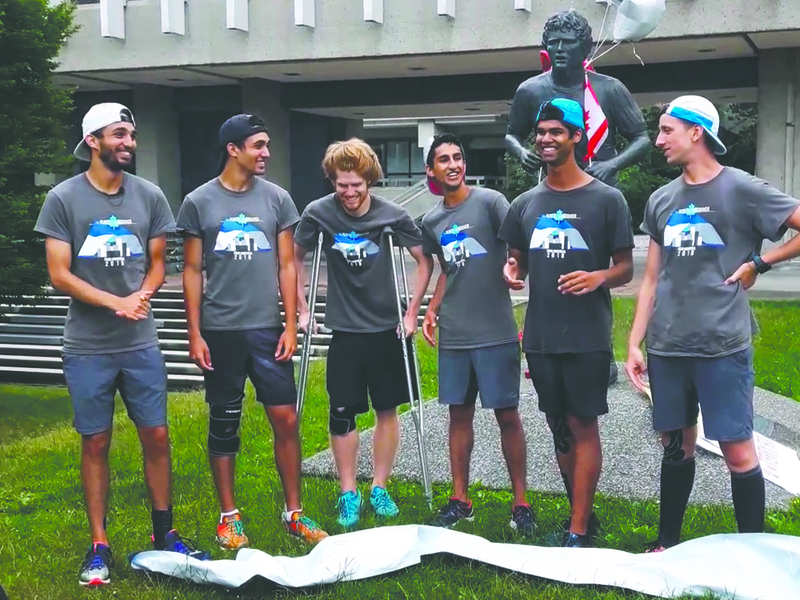 Akshay Grover, Keiston Herchel, Muhan Patel, Declan McCool, Marc-André and Mathieu Blouin ran together for 28 days and arrived together with smiles and tears. Michael Davies, had to drop out before the start due to an accident. There were hardships along the way. Ontario was long. It rained, it was hot and humid, and gasoline was expensive. When they reached the Terry Fox monument in Thunder Bay, the spot where Terry Fox had to stop his Marathon of Hope due to the cancer in his lungs, it all came into perspective. Inspired by Terry’s legacy, they knew they had to finish this run! A small crowd gathered in the rain at Simon Fraser University to cheer the runners over the finish line. It was an emotional end to a fantastic journey. Keiston was handed crutches as his knee was in need of medical attention. The six men hugged and cried. Passersby handed them $10 or $20 for the fundraising effort. The Montreal runners have learned this lesson early! They hope no one has to face cancer to learn this message. The Terry Fox Foundation funds research into cancer treatments that have improved the survival rates of all kinds of cancer. This research gives us hope. 1 Comment on "Montreal Runners reach BC and welcome donations for Terry Fox Foundation"